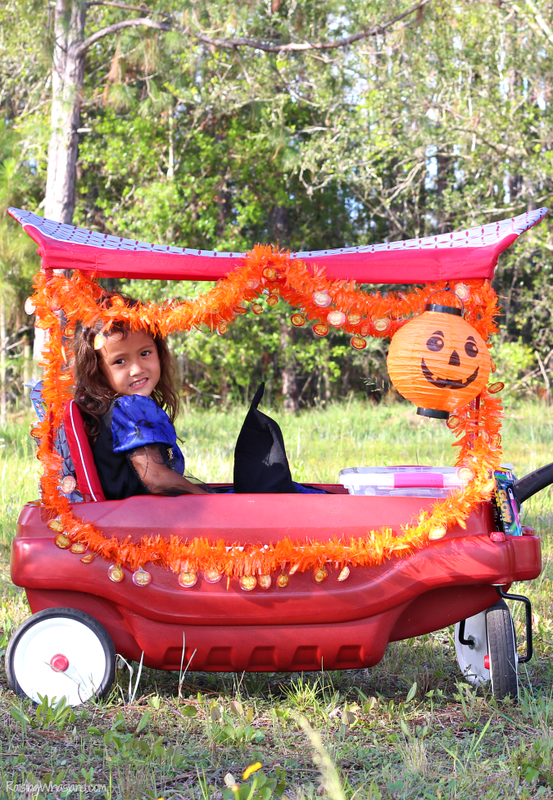 Take the stress out of Halloween with this DIY Trick-or-Treat Wagon + Affordable Kids’ Costumes at Family Dollar. This post is sponsored by Family Dollar. All festive opinions are my own. Is your family ready for trick-or-treat season? I admit that trick-or-treating with two kids can be challenging, especially with so much Halloween excitement! But one of the ways that we stay prepared is making sure we have all of our Halloween essentials in tow. 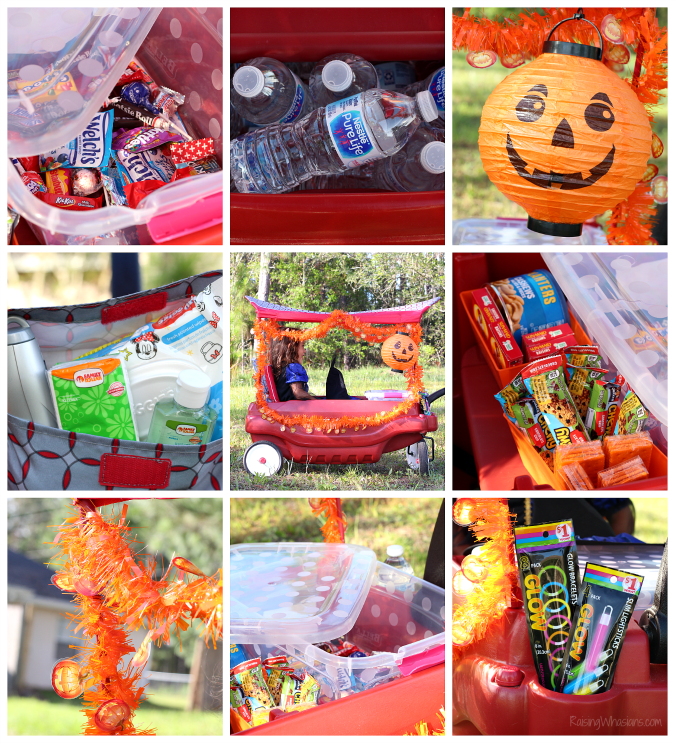 This year we packed up our trick-or-treat survival kit in this festive DIY Trick-or-Treat Wagon! 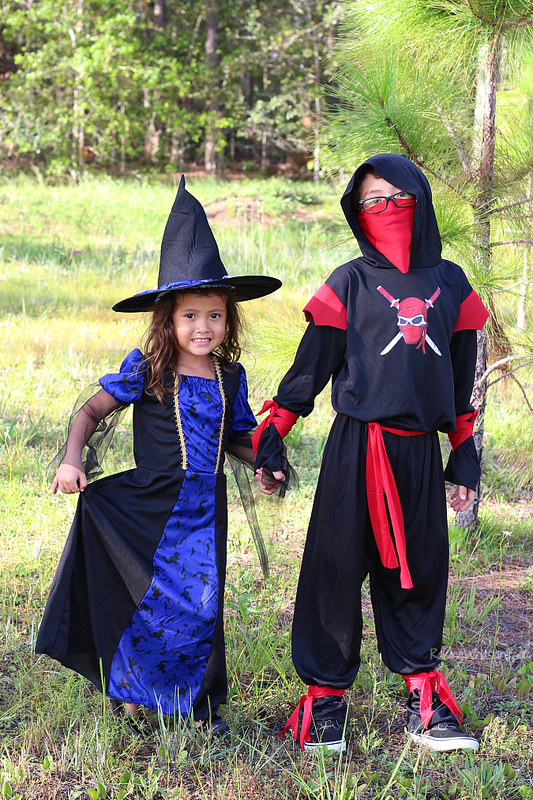 Find out how to stock your own as well as how we found adorable and affordable kids costumes at our Family Dollar! Once a frugal mom, always a frugal mom. I have the hardest time buying my kids’ Halloween costumes every year. I can never justify paying so much for an outfit that my kids will maybe wear once, twice if I’m lucky. My kids are constantly changing their minds too. One week it’s all princesses and super heroes. The next week it’s fairies and monsters. Family Dollar takes the stress out of getting Halloween costumes for my kids. From classic costume ideas and even licensed kids’ favorites, there’s definitely plenty of variety to choose from. And with lots of great options starting as low as $5, I can grab costumes that look great and my kids can enjoy without breaking our budget. I’m proud to say that this year we only spent $10 total on my kids’ Halloween costumes at Family Dollar. Aren’t they cute? 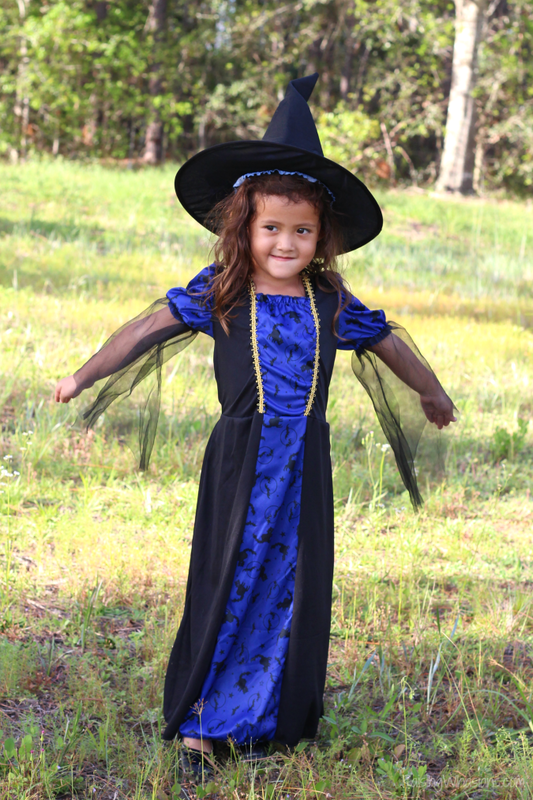 My daughter’s witch costume is an adorable addition, and even comes with the pointy hat! 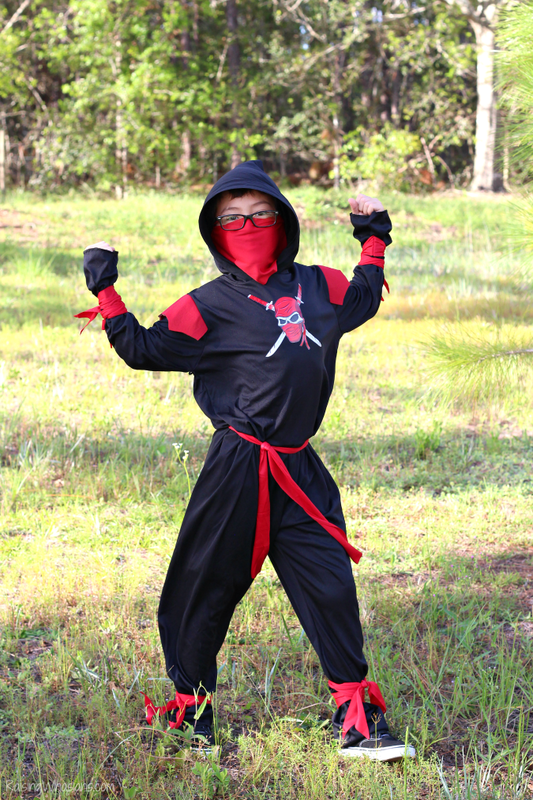 And my son loves his new ninja costume, complete with stealth mask. Pack up your trick-or-treat survival kit on-board your DIY Trick-or-Treat Wagon! We are ready to grab all of the candy and fun this Halloween with these DIY Trick-or-Treat Wagon Ideas, all with items that we grabbed from our local Family Dollar. Be sure to look for Everyday Low Prices, Price Drop and $1 WOW items for big savings on your Halloween essentials. Festive Decor – Why should the kids get all of the dress-up fun? Decorate your DIY Trick-or-Treat Wagon for less with festive decor ideas at Family Dollar. We grabbed tinsel and this adorable pumpkin lantern for only $1 each! Safety First – Keep those kiddos safe throughout the night with a supply of glow sticks and glow necklaces. Family Dollar has lots of choices to match your child’s costumes for only $1! Be sure to have a flashlight on hand as well. Bring extra batteries! Keep it Clean – Get out of any sticky trick-or-treat situation with a few items to keep things clean! I always pack hand sanitizer, baby wipes and a few tissues on-board our wagon for any emergencies. Treat Storage – Do your kids trick-or-treat bags get heavy throughout the night? We like to store ours in a sealed plastic tub in our wagon. Perfect place to lighten the load and keep out any sort of weather (or even little hands! ), we can keep all of the treats safe and secure until we get home. Hydration – Don’t forget to keep those trick-or-treaters hydrated throughout the night! We stock up our Trick-or-Treat Wagon with a case of water so the whole family can replenish. Energy-Packed Snacks – No sugar crashes here! Pack your wagon with energy packed snacks to maximize your trick-or-treating. Family Dollar has lots of name-brand snack ideas like Sun-Maid Raisins, Quaker Chewy Bars and Planters Nuts. From affordable costumes to DIY Trick-or-Treat Wagon essentials for less, I love how Family Dollar is our one-stop-shop for everything Halloween this fall. 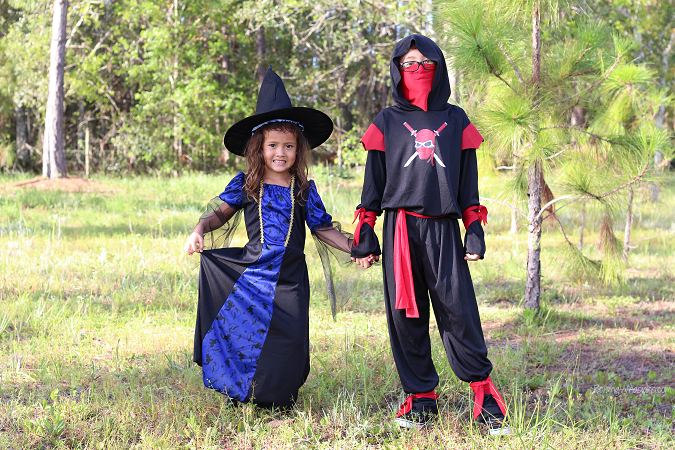 Stock up on your favorite Halloween costumes, ideas and more at your local Family Dollar. 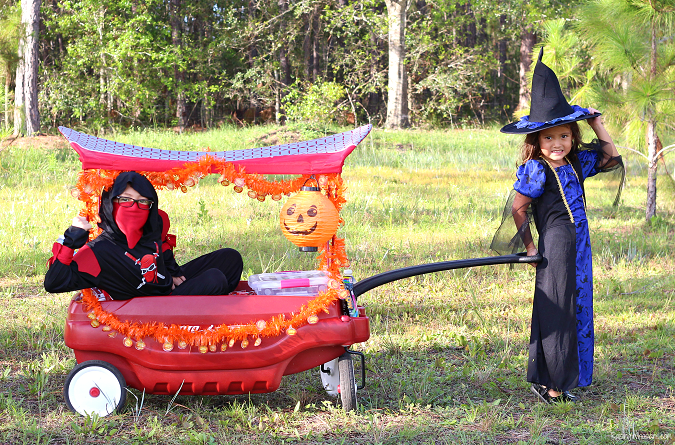 What would you stock in your DIY Trick-or-Treat Wagon this Halloween? Be sure to follow Raising Whasians via Facebook, Twitter, Google, Instagram, Pinterest and YouTube for crafty inspiration, family recipes, travel tips and more. These are affordable costumes and they really are great for Halloween. I need to check out Family Dollar for my kids, and they would love a decorated wagon! That wagon is so great! I’ve never thought of using props like this for Halloween. Genius! I think this is the best idea ever! 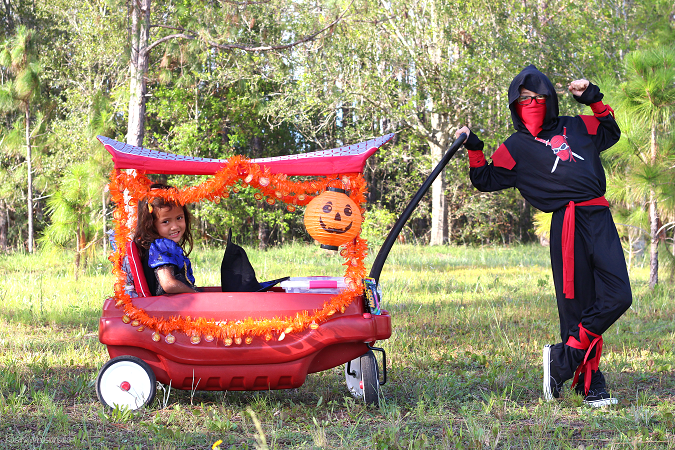 She’s like a little Halloween princess with her carriage and ninja bodyguard! So cool! I also have a hard time paying a lot for a Halloween costume that my kids will never wear again. I’ll be sure to check out all of the options Family Dollar has so I can make this Halloween an affordable one. I like that ‘jack-o-lantern’ paper lantern, Do they light up on their own or do you put it over a bulb? Comes with the bulb! Would you believe it’s only $1 at Family Dollar? I wouldn’t have thought to look at Family Dollar! Amazing prices and cute, too. The kid are getting big!!! The wagon is an adorable idea! This is a great idea, why pay more than you have to for a costume! That is such a cute idea and your kids look adorable! I have never thought of having a Trick or Treat wagon. What a great idea for younger Trick or Treaters. That is such a cute idea. I love the way that you planned for every problem. I wish I would have had this when mine were small. I love the idea of decorating the wagon for Halloween. Don’t you appreciate the great prices Family Dollar offers? Love shopping with them. I love the idea of trick or treat wagon! These days it’s just my youngest who goes trick or treating and this would be perfect for her! I love the costumes as well. Cute idea. Love the wagon. I can’t believe how affordable these costumes and decorations are! I love the costumes that you guys picked, so adorable! This is an awesome idea especially if you have very young kids. They can just sit in the wagon and have the older siblings pull them along. Your kids’ costumes are cute too. I guess they are all ready for the big day. I love the idea of pulling a little wagon like this. The younger ones are always getting tired and pulling them is easier than carrying them. So many fun ideas. Love this for Halloween. We go to a few Halloween events, so this is perfect for us. These are such great ideas and I wouldn’t have thought about Family Dollar for costumes. But that wagon is just the best! SUCH a great idea with the wagon!! My son’s legs are always tiring right out about a half hour into trick or treating. Decorating it makes it so much more fun!! And yay for saving cash on some super cute costumes!! Total #momwin! This trick or treat wagon is a good idea and would be great for my grandsons. I wish we had a Family Dollar where I live.